Quilting with rulers... and a whole lot more! I created this and other videos like this one to help some friends. Hope it helps you too. your quilting rulers. School supplies were on sale so I decided to purchase a few binders to store my quilting rulers and supplies. I hope you like this little guy as much as I do. 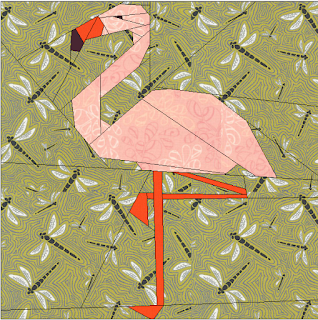 Flamingos remind me of vacation and summertime!! The paper pieced block is 10x10 finished size and he is free, My summer gift to you. Enjoy! In honor of the Chicago Cubs winning the world series, I created a special free paper pieced pattern in a 12 x 12 block.